Butter a small baking tray. Mix together the sugar, water and lemon juice in a medium-sized saucepan. Put it on medium-low heat, and warm until the sugar dissolves. Turn up the heat and cook for about fifteen minutes, until the mixture is golden brown. Don’t stir at all, but you can dip a brush in warm water and brush down the sides of the pan. When it’s golden brown, take it off the heat and stir in the nuts. Spread in a thin layer on the buttered baking sheet. Leave in a cool place to set. Preheat the oven to 300. Butter and flour a cake pan or springform pan. I lined mine with a square of tinfoil as well, and buttered and floured that. If you’re trying to keep this gluten free, use cornstarch instead of flour. In a small saucepan over a larger saucepan full of boiling water, melt the butter and chocolate. Stir till nice and smooth, and then take off the heat to cool for a while. In a small bowl, beat the egg whites until stiff. In a larger bowl, beat the yolks until pale yellow and frothy. Beat in the vanilla, coffee and liqueur. Meanwhile, combine the almonds, sugar, salt and cornstarch in a processor and process until the almonds are completely ground and powdery. Add the egg yolk mixture, and continue to process until it’s as smooth as you can get it – for a few minutes. Pour all of this back into your big bowl, and beat in the chocolate and butter. Put a large spoonful of egg whites into the batter, and gently mix it in. Then add the rest of the egg whites and gently fold them in. Pour this mixture into your prepared pan. Bake for about 40 minutes, till it springs back slightly when you touch it, it’s pulled away from the pan a little bit, and a knife inserted in the center comes out clean. Leave to cool, and then carefully remove from pan, and place upright on a pretty plate. Melt the 1/2 cup of chocolate chips in a small saucepan over a bigger saucepan of boiling water. Beat until smooth, and then spread over the top of the cooled cake. Sprinkle a pinch of salt over the top. Serve with fruit and a bit of whipped cream, if you like. 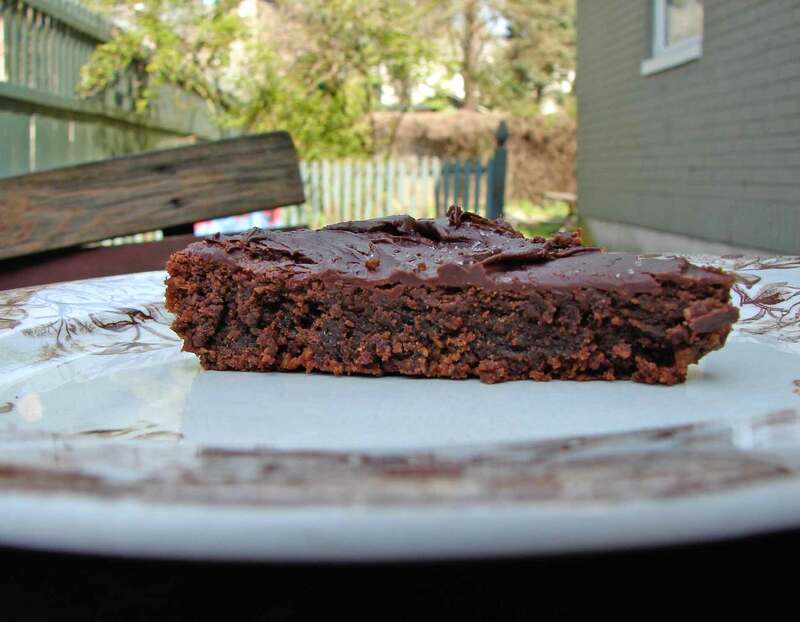 This entry was posted in cake, chocolate, dessert, recipe and tagged almond cake, danger doom, flourless chocolate cake, gluten free chocolate cake, old school, salted almond praline, super hero powers, talib kweli by Claire. Bookmark the permalink. Great recipe. 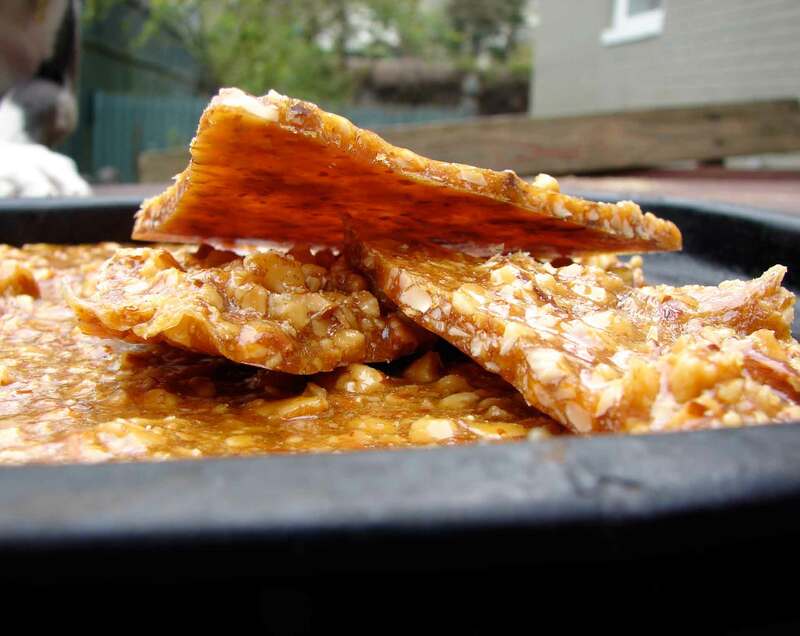 Love the praline. I like to keep the skins also.